Until last week, I'd forgotten what it was like to be warm. Seriously though, sometimes I wonder why I haven't packed up and moved to California already... Maybe because I have no money, and you know, there's earthquakes there - big ones. So, England it remains. I don't mind the U.K. so much on days like Thursday and Friday, walking to work along the Leeds and Liverpool Canal, past the houseboats and the teenagers sneaking bevvies on the bridge. It's quite idyllic, actually. I have to say that despite the usual tundra-like conditions we survive in Britain, there is one thing we do really well here. That thing is... The Beer Garden. We shiver in them during the winter, drinking pints and smoking slightly soggy rollies. We spend days on end in them (quite literally) as soon as the temperature hits double figures. I went to one the other day in Brighton that has it's own pet cat. The beer garden is a beloved national treasure. 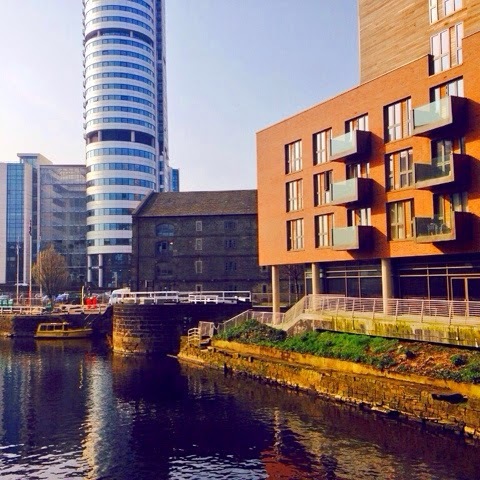 And so, to mark the beginning of our three month heatwave (something I'm slightly skeptical about...) I've decided to compile a list of the best ones in Leeds. I'll be perusing as many as I can, finding out which outside area is the nicest and best-est to drink my vino in. The Tetley is just over the bridge from the bottom of Briggate, so it's slightly set back from the city centre, but still has all the hustle and bustle. This isn't somewhere you're going to stumble across as you stroll up Upper Briggate and chance a pint in - this is a destination that people are driven towards in their droves because of the art gallery, the cracking food, and the amazing events and workshops put on inside and ... dun dun dun...outside! The building itself is huge, elegant, and - most importantly - it has a great terrace. There's rows of picnic benches and plenty of space for standing, so it's optimum for big groups. It may be right next to a car park, but the atmosphere is anything but derelict. The bunting and the field in front bring splashes of colour to this Art Deco paradise. A very strong contender for the crown of Leeds' Best Beer Garden!